The Brusselator is a theoretical model for a type of autocatalytic reaction. The Brusselator model was proposed by Ilya Prigogine and his collaborators at the Free University of Brussels. We will use a Cartesian (multi)grid, the generic time loop and the time-implicit diffusion solver. We need scalar fields for the concentrations. 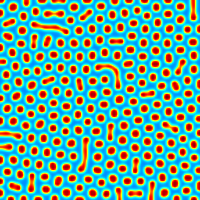 We change the size of the domain L0 and set the tolerance of the implicit diffusion solver. Here μ is the control parameter. For μ>0 the system is supercritical (Hopf bifurcation). We test several values of μ. The marginal stability is obtained for kb = kbcrit. The (unstable) stationary solution is C1=ka and C2=kb/ka. It is perturbed by a random noise in [-0.01:0.01]. Here we create an mpeg animation of the C1 concentration. The spread parameter sets the color scale to ± twice the standard deviation. We make a PNG image of the final “pseudo-stationary” solution. We first set the timestep according to the timing of upcoming events. We choose a maximum timestep of 1 which ensures the stability of the reactive terms for this example. We can rewrite the evolution equations as ∂tC1=∇2C1+kka+k(C1C2−kb−1)C1 ∂tC2=D∇2C2+kkbC1−kC12C2 And use the diffusion solver to advance the system from t to t+dt. 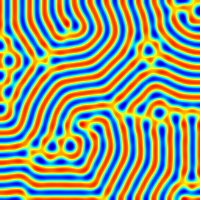 We get the following stable Turing patterns.